← ACOTANGO, Bolivian Mountain Guides. I spent a day climbing Pico Austria (four days ago as aclimatization) with my wife (who had no prior mountaineering/trekking experience) and Eduardo, the founder of Bolivian Mountain Guides. It was an amazing experience, also and especially for her. She felt very safe and encouraged by him. He responds as quickly as you can want it on whatsapp! We asked him one day and were on the Peak on the next. He organized everything from extra equipment (because we were travelling light and did not have much with us in La paz) to a great and WARM (!) lunch (oh, and breakfast as well before starting to trek) on the mountain top. He is ultra experienced, has done almost every peak you come across in the Cordillera Real. He is a funny guy to hang out with. He emphasized that being in the mountain with all its seriousness and danger is also about having fun and enjoying the beauty. We definitely sensed this mindset throughout our day. And i dont take that for granted. There are other guides who make you feel quite bad! Some of you might know that. He does not rush you (like many other guides), he always puts safety first and he is flexible to whatever wishes you might have or what the weather might do. Oh, and also he takes many (as he calls them) „surprise fotos“, which turn out to be very good and sends them to you after the day. Because of all of the above I booked him again two days later for a 2-day ascent of Huayna Potosi which I just got back from. A tough ascent that should not be underestimated. But with Eduardo it was an amazing experience….he verbally pushed me up the last 300 vertical meters!! And throughout the whole expedition he stayed calm and relaxed. To me personally that was a key feature because many other clients (especially from other guides) were nervous and anxious which was not always met with a professional sympathy by other guides. I would definitely recommend Eduardo and his company as he puts a high standard on his employees and is suitable for all levels of alpine and trekking routes. To be honest, I am already looking forward to the next trip to Bolivia and i will definitely contact him for guiding me up some more of these beautiful peaks!! An alle Deutschen: wirklich wahrscheinlich einer der besten Bergführer in La paz. Geld ist gut investiert und er verlangt auch nicht außergewöhnlich viel. Sein Englisch ist okay…aber er freut sich, wenn man zumindest etwas Spanisch kann. Dann spricht er auch extra langsam und lacht viel mit (und auch manchmal über) einen. Definitiv empfehlenswert (siehe detaillierte englische Bewertung). 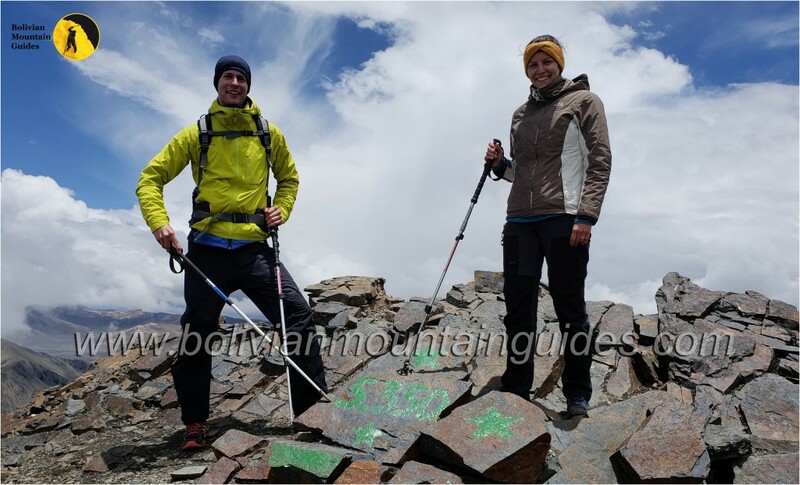 Bolivian Mountain Guide UIAGM, ice climbing and trekking. "Thank you for visiting this site, and this blog! 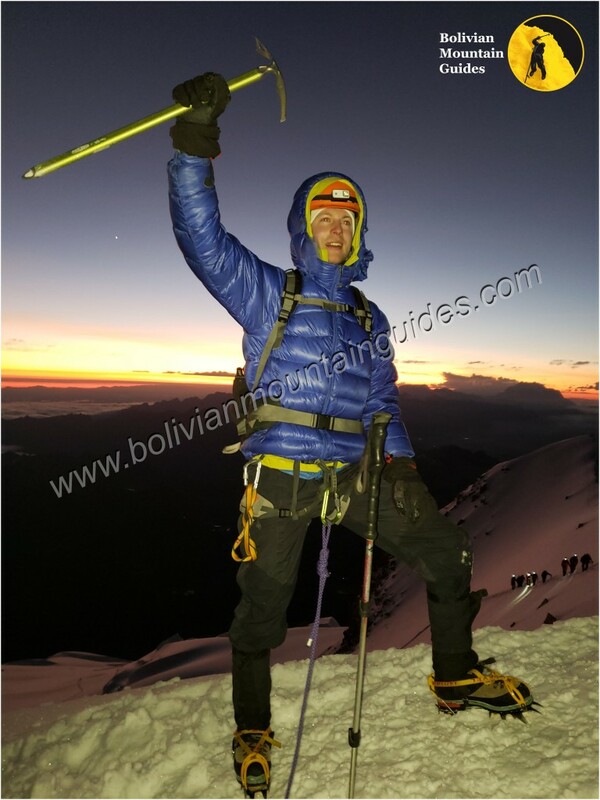 Here you'll find news about climbing and trekking in Bolivia, as well as reports from my most recent and future adventures! This entry was posted in Our adventures and tagged Andean Summits, bolivian mountain guides, bolivian mountaineering, Condoriri, Huayna Potosi, ice climbing, Illimani, Pequeño Alpamayo, Pico Austria. Bookmark the permalink.